I was recently given an opportunity to sample Nanami Green Tea through my association with FitFluential. These are organic geen teas from the Kyoto region in Japan. 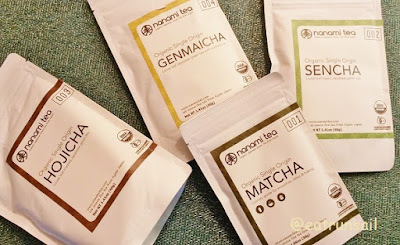 I was given the Nanami Zen Set, made up of 4 different organic green teas, along with a tea brewing guide, and asked to take part in a #7daydrinkgreen challenge. This challenge involves giving up soda and sugary drinks in favor of water and the Nanami Green Teas for 7 days. I eagerly accepted. I never drink sugary drinks anyway and knew I could easily forego soda in favor of green tea for at least the required 7 days. My experience with green tea is very limited. I do occasionally enjoy Matcha powder and have done a bit of experimenting with it. But I admit... most of the green tea I have drunk has come in the form of a tea bag, so all of these exotic looking tea leaves seemed a bit intimidating. I started the #7daydrinkgreen challenge on Sunday, April 9th. The first thing I did was to read throught the brewing guide from start to finish, and learned about the 4 different teas in the Nanami Zen Set and when and how to brew and enjoy them. The first tea I decided to try is called SENCHA. 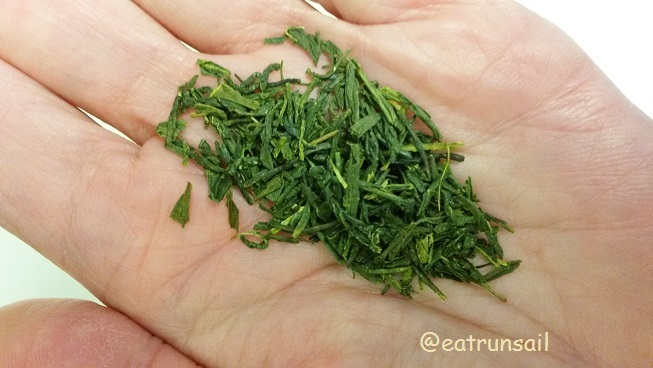 Nanami Green Tea says that it is high in caffeine with a fesh, lively flavor. They suggest you use it for pre/post workouts because it provides an energy burst. I chose to have it mid-morning when I might normally go for a cup of coffee. I was quite surprised at the lovely bright green color of the leaves. And the taste? It is very refreshing... and it tastes and smells green, too. I chose to try the MATCHA for my second tea sampling. 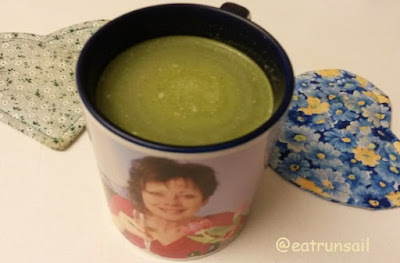 I am familiar with Matcha tea so I decided to make a Matcha Latte to enjoy in the afternoon as a snack. I put just less than a teaspoonful of the Matcha tea powder into a mug, and added about an ounce of very hot water and stirred it to make a paste. Then I added about a cup of unsweetened almond milk that I had heated to steaming in the microwave oven... a bit of stevia and it was done. This is definitely going to become an afternoon favorite and The Captain really liked it too. There is more caffein in this variety. It is a versatile powder that can be added to smoothies or nice cream or even just stirred into yogurt. And I understand that some people like to stir Matcha tea powder into sauces and baked goods, too. And it is high in antioxidants. Apparently this is also good as an iced, cold drink... I have yet to try it but will be doing that soon. 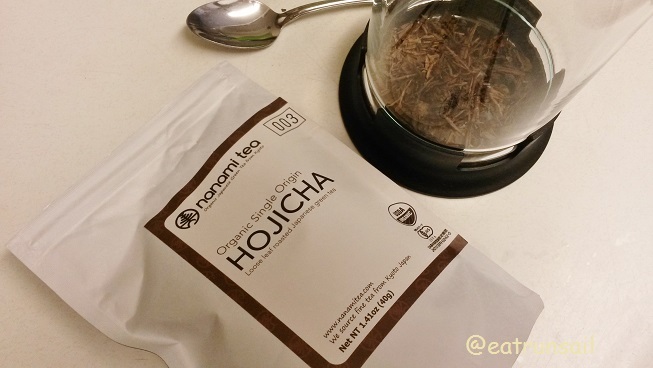 The GENMAICHA tea leaves are blended with roasted organic brown rice. 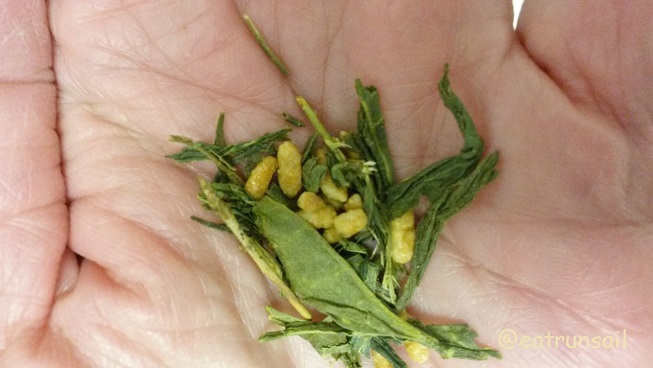 Nanami Green Tea suggests that the Genmaicha tea can be drunk before meals in order to suppress one's appetite. I admit to enjoying it any time of the day. It is low in caffeine and so we can also enjoy it in the evening without any concerns about sleep interruption. And the HOJICHA has become my favorite. It is somewhat nutty tasting. I love that it is lower in caffeine and it brews up into a beautiful carmel color... actually has a slight carmel taste, too. 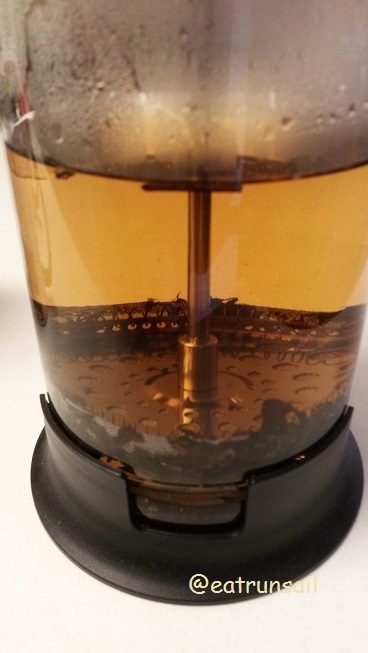 I have been brewing the Hojicha tea in my French Press so that I can enjoy the color... what I really need, is a set of clear glass tea cups... I think the visual appeal of these teas really adds to the enjoyment of the tea experience. This tea is lower in caffeine too. And so my #7daydrinkgreen challenge has come to an end... but not my enjoyment of these Nanami Green Teas. I plan to keep using them and broaden my green tea horizons and knowledge. The Nanami Zen Set included four types of organic green designed to power up and support your daily activity. Organic certified. Calorie-free. Sugar-free. All natural. From Uji Kyoto, Japan. If you are interested in learning more, and trying Nanami Green Tea yourself, do follow this link to their web site. And use coupon code EATRUNSAIL15 for a 15% discount on any purchases you make. This code has been provided by Nanami Green Tea for readers of my blog only. I will not profit in any way from your use of the code. Are you a tea fan, too? What is your favorite? but this? I could definitely get behind this one. I love my tea. I really enjoy tea but don't drink it very often...I could definitely benefit from having some tea instead of quite as much coffee. This sounds great! I love tea and I can't wait to try the 7-day challenge! Yum, I like that challenge! I've never thought to do a tea one before. This sounds like a fun taste test! I love green tea but don't drink it often enough. Interesting! I definitely prefer tea over coffee, but have not gotten into green tea...yet. The flavors sound great! I love trying different flavors of green tea- that is so much fun! Great job on the challenge- that was a good one! I rarely drink tea. I'm a coffee girl. But these teas sound really nice and flavorful! Interesting. I am not a regular tea drinker, but I do like to try different kinds once in a while. I drink green tea every day--but I brew it and pour it over ice. I'm a huge fan of Rishi Matcha green. Not at all a tea drinker. I will have it sometimes when my allergies are in full swing, but just black tea with honey or lemon tea. Mr PugRunner loves it. He's got countless jars of tea leaves in our pantry. I don't even know what half of them are LOL! I don't drink tea but love my half caff coffee in the mornings! These sound nice! I have started incorporating more green tea into my day and I really love the results!! Since I don't drink coffee, its tea for me. There's so many great choices out there! They look good. I'm not a tea or coffee drinker, shocking I know! However, every so often I'll have a peppermint tea.